20% discount for bookings between 7th December 2018 & 11th January 2019 due to shorter daylight hours. 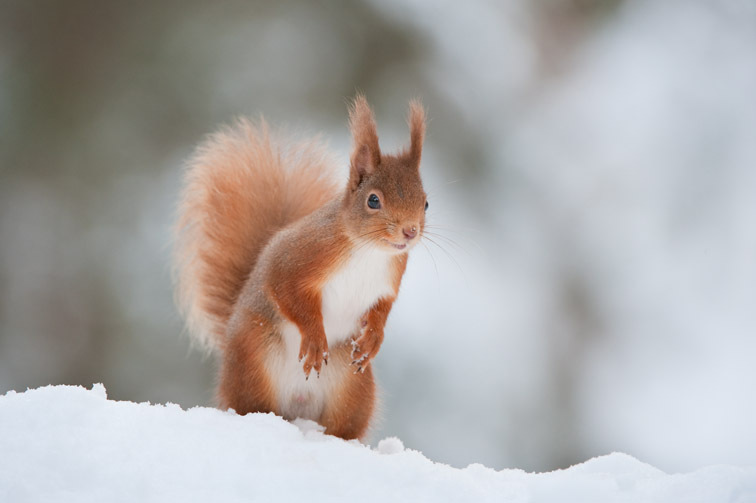 Winter is arguably the best season to photograph many of the speciality species of the Scottish Highlands. 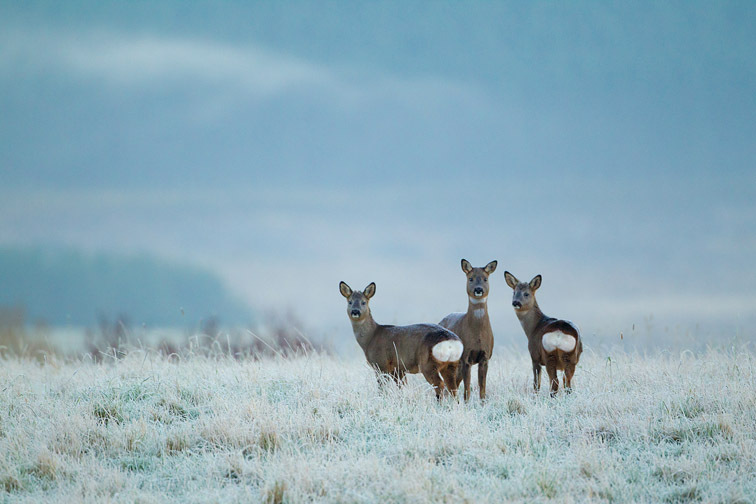 The wildlife is in fine fettle with pristine plumage and thick winter coats and tends to be more approachable, allowing for some exciting close-up encounters. 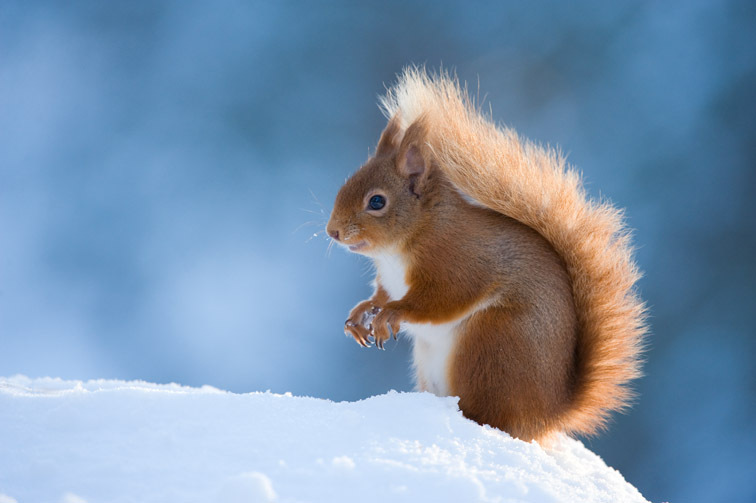 There are a number of species that can be photographed during the winter months within or close to the Cairngorms National Park including Red Squirrel, Red Deer, Mountain Hare, Ptarmigan and Red Grouse and we can target one or more of these during your visit. Typically, we would try to photograph two species per day although sometimes it may be best to dedicate a full day to just one species, bearing in mind that the daylight hours in northern Scotland are quite short in winter. 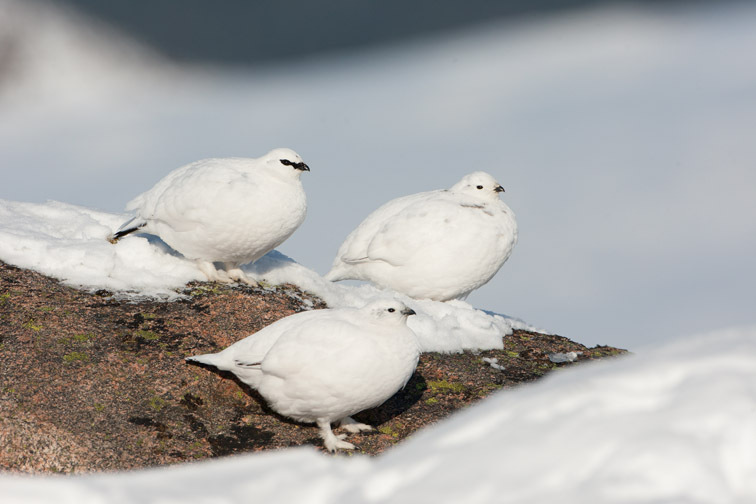 The weather also plays it part and it may not always be possible to photograph Ptarmigan if the mountain conditions are unsuitable. Below is an outline of what’s involved and what you can expect for each of the listed species but if you require any further information then please use the enquiry form or send me an email. Level of fitness: Easy: a short walk on a woodland path. Photography from a wooden hide in a clearing in a pine woodland setting with natural props and an attractive backgrounds. An alternative hide at a woodland pool is also available (1 person only). 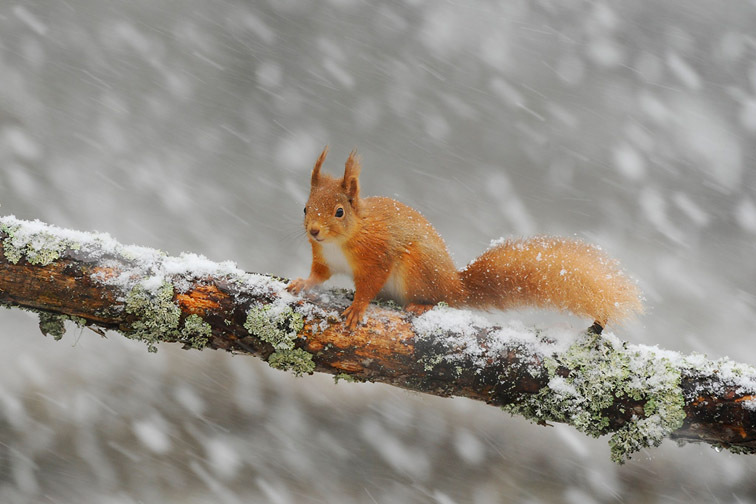 There are typically 4-5 red squirrels visiting the feeding station where they are baited with hazelnuts with most activity during the morning. During a 2-3 hour morning session you can expect a good number of visits providing plenty of opportunities for portraits and action shots including jumping if there is sufficient light. Frost and snow are common during the winter months but can never be guaranteed of course. In milder (frost-free) conditions a session at the pool hide can be more productive allowing you to secure beautiful reflection shots of the squirrels. Level of fitness: Easy: a short walk or photographing from a vehicle. Photography is predominantly from a vehicle but stalking is sometimes possible. 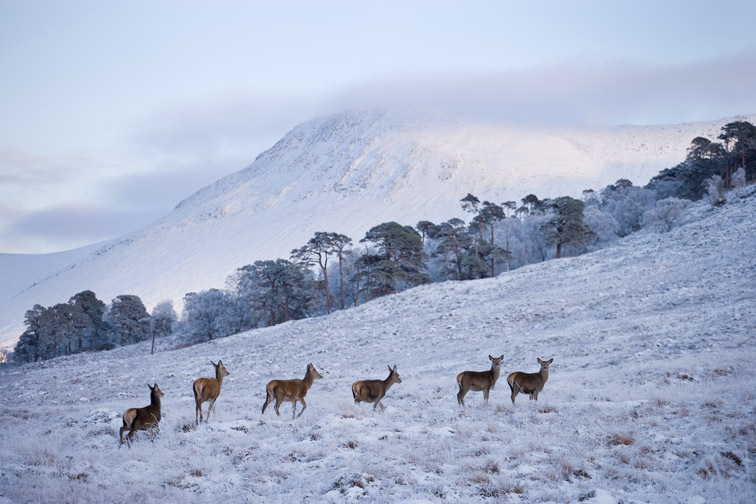 During cold spells red deer stags are provided with supplementary food on some Highland estates which means that they can be approached much more closely. 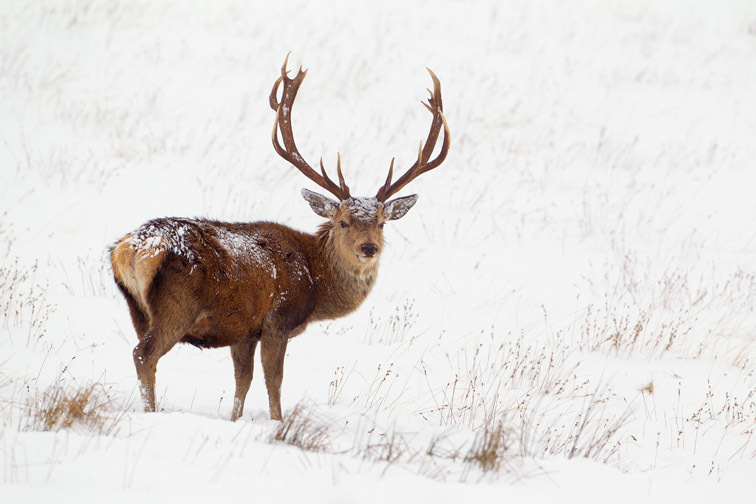 There are several locations where we can target red deer photography ranging from a pine forest habitat to a highland glen with mountain backdrops. 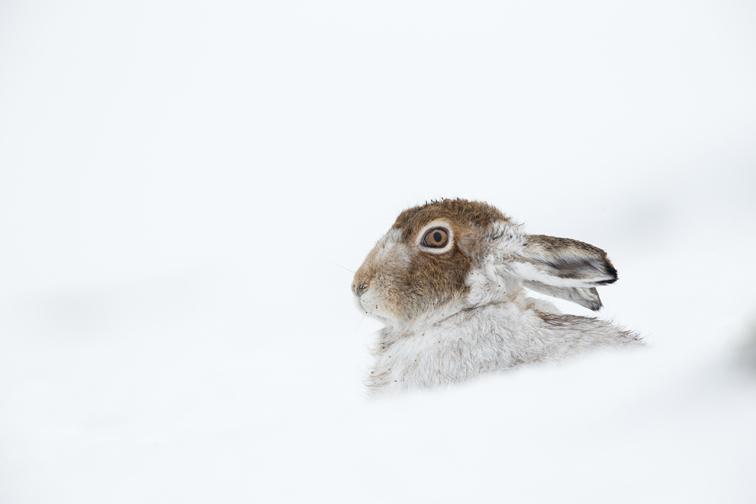 Depending on your objectives and the weather conditions we can spend an afternoon or an entire day photographing these magnificent animals aiming for a range of images from portraits to animals within their environment. Level of fitness: Easy: Photographing from a vehicle. Photography predominantly from a vehicle but stalking is sometimes possible. 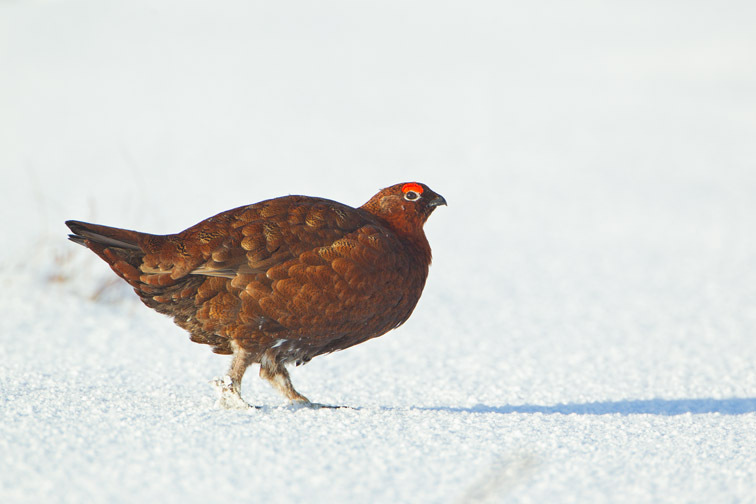 Red grouse are very territorial and as a result will remain in favoured areas of the moor for much of the year. There are a few spots where roads bisect good red grouse habitat and we will use this to our advantage to secure images of this striking bird amongst the heather. When there is snow on the ground you can expect to obtain some colourful and seasonal images of the male birds which will be in tip top condition. From February onwards male birds will become even more territorial and on calm days can be photographed calling and standing prominently on top of the heather and boulders. Half / Full day activity. Level of fitness: Moderate. A short walk over a distance of no more than 1 mile, mostly flat with some uphill. 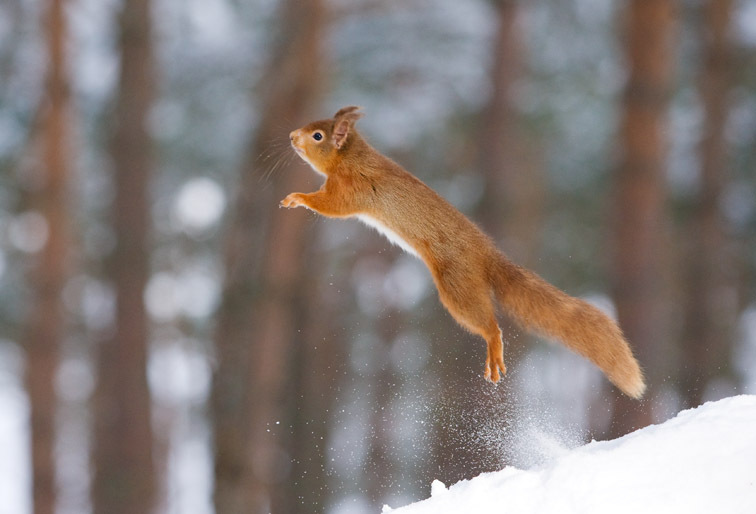 This is more difficult in deep snow. You should also be prepared to spend lengthy periods waiting in cold temperatures. 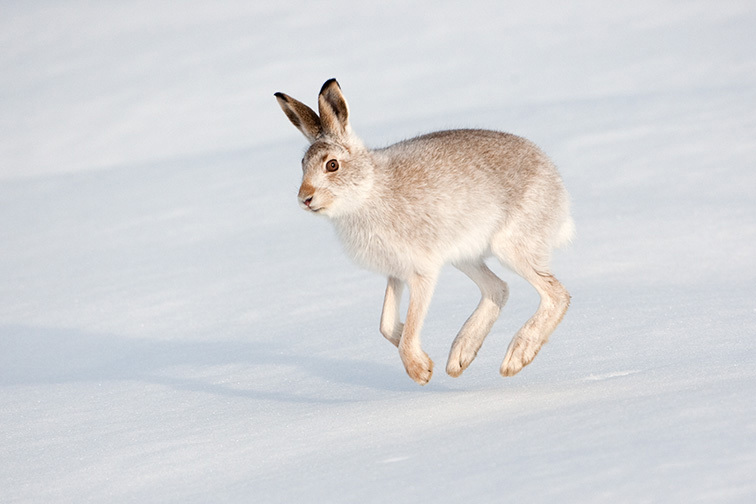 We will be on foot and in the open for the entire time in order to photograph the hares in their natural environment, so you need to be well prepared for the cold and possible snow/rain. 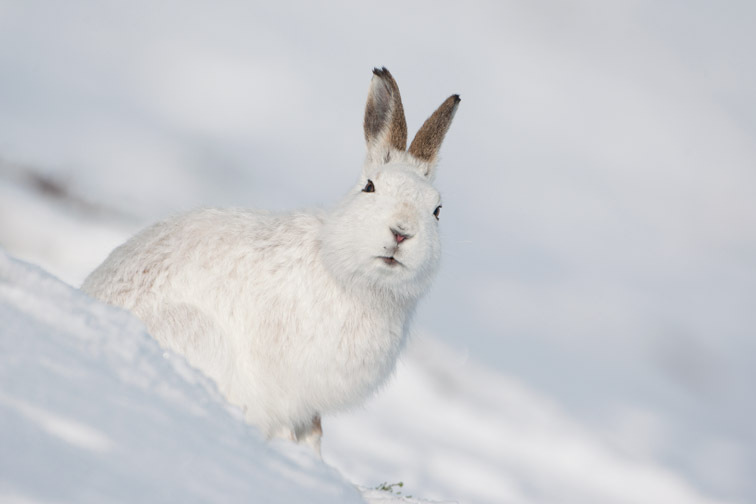 During the day mountain hares tend to lie up in snow holes and once located can often be approached to within less than 10m. 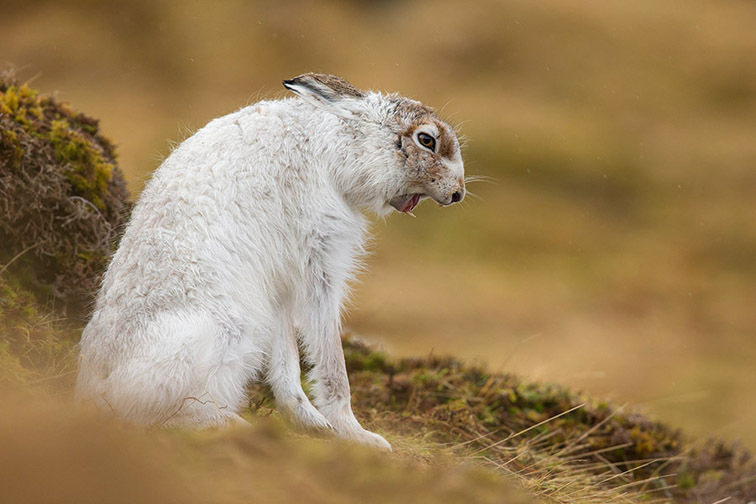 This allows for some superb close-up opportunities but what we will aim to do is to locate a confiding hare and then sit with it for an extended period of time as this approach always yields the most rewarding images of hare behaviour. Do bear in mind that not all hares are approachable and we may have to search for some time before we find a hare that we can work with. Level of fitness: Strenuous: Involves walking uphill in snow and ice over a distance of 2-3 miles into a high mountain environment. You should also be prepared to spend lengthy periods waiting in cold temperatures. 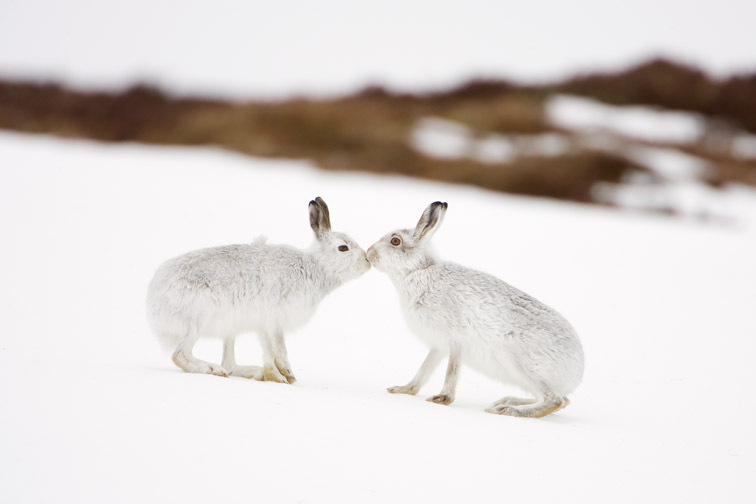 When the weather is favourable this is one of the most rewarding winter wildlife photography activities in the Highlands. Not only will you have the chance to photograph one of Scotland’s most charismatic birds but you’ll also enjoy a truly wild place and stunning mountain scenery. 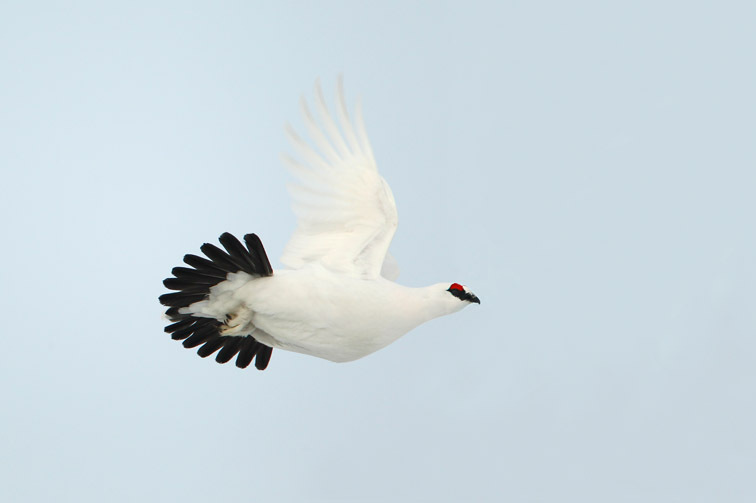 Ptarmigan are one of the few birds that can be approached on foot relatively easily, although as with the hares some individuals allow a closer approach than others. The birds hang out in the same areas each winter and this knowledge is key to success, allowing us to locate birds in favoured areas. 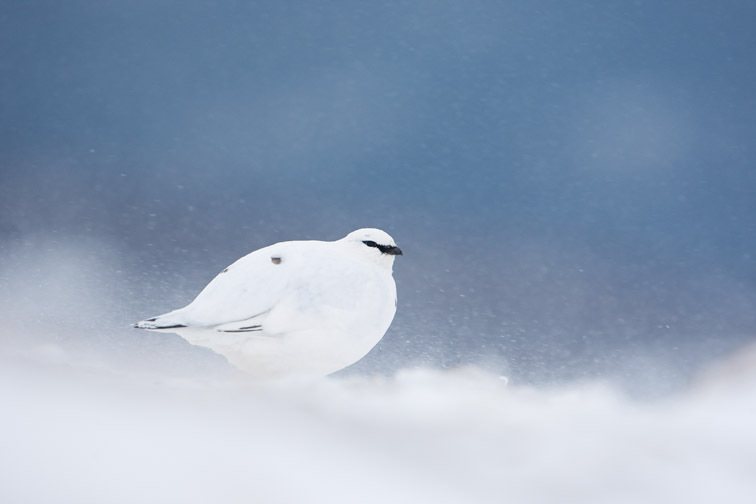 In deep snow the birds are forced much lower down the slopes - good news for us - and can be found in groups of 40 or more. As the winter progresses the males become more territorial, proclaiming their presence with unmistakeable croaking calls, often from on top of a rock. Pairs tend to remain together most of the time and we’ll aim to find a confiding pair of birds and stay with them for an extended period of time to capture a range of images. Dawn until dusk - typically 0800 until 1600 with approx 4-6 hours of photography in the field depending on subject and travel times between locations. Telephoto lenses are rquired for all species in the range of 300-600mm. Solid tripod with suitable head for supporting telephoto lens.